Brett Favre, please don’t go!! > News > Brett Favre, please don’t go!! NOOOOO Brett, don’t do it!! I don’t care if you’ve been in the league for 19 years, I don’t care that you’re a Granddad now, I don’t care if other people think you’re too old and are ready for you to go. I don’t even care if you don’t have as great of a season as you did last year. You represent the good that’s left in professional athletes and you’re an example that everyone should follow whether they play football, basketball, baseball, soccer, golf, tennis, hockey, or freaking croquet. Please don’t go!! 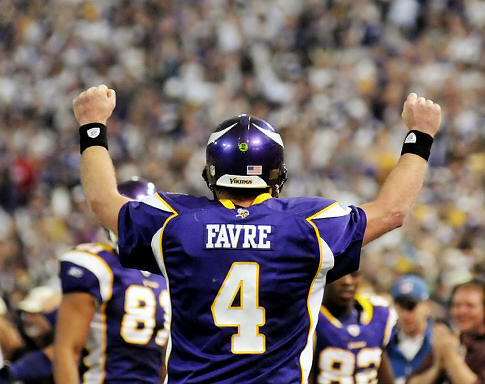 No, I’m not a Vikings fan, but I’m a fan of you and the way you’ve played the game for nearly 20 years. To hell with only being 671 yards away from 70,000 career passing yards or only needing 3 more TD passes to get to 500. This is about the love for the game and the way you play it so don’t go. Let the haters talk trash about you; let them say whatever they want!! You’ll just shut them up like you always have with your game, not your mouth.